You can enter type that flows along the edge of an open or a closed path. The path can be regularly or irregularly shaped. When you enter type along a path, the path is no longer stroked or filled. You can paint it later if you want, without affecting the paint attributes of the type. 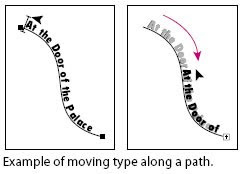 Entering horizontal type on a path results in letters that are perpendicular to the baseline. Entering vertical type on a path results in text orientation parallel to the baseline. To toggle between the type tool and the vertical type tool when another type tool is currently selected, Shift-click. 1 Select the type tool or the path-type tool . 2 Position the pointer on the path, and click. An insertion point appears on the path. 3 Enter the type you want. Type appears along the path, perpendicular to the baseline. 1 Select the vertical type tool or the vertical-path-type tool . 3 Choose Standard from the Direction pop-up menu. 4 Position the pointer on the path, and click. An insertion point appears on the path. 5 Enter the type you want. Type appears along the path, parallel to the baseline. 2 Position the pointer on the I-beam in the type. 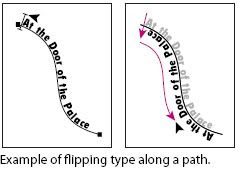 creates an even flow of type along the curve. 1 Select the selection tool . 2 Position the pointer precisely on the I-beam. • Drag the I-beam across the path. The initial direction of type flows in the order that points were added to the path. If you want your text to flow from left-to-right without having to flip the I-beam, construct your paths in that order. To move type across a path without changing the direction of the type, use the Baseline Shift option in the Character palette. For example, if you created type that runs from left to right across the top of a circle, you can enter a negative number in the Baseline Shift text box to drop the type so that it flows inside the top of the circle. The Delete Empty Text Paths option in the Cleanup dialog box lets you delete unused type paths and containers from your artwork. Doing so makes your artwork more efficient and easier to print. You can create empty type paths, for example, by inadvertently clicking the type tool in the artwork area and then choosing another tool. 1 Choose Object > Path > Clean Up. 2 Select Delete Empty Text Paths, and click OK. The great post about Adobe Illustrator CS3, it's a very helpful software, thanks a lot for sharing. Thank a lot for share of this information. May I say it typography?? this post is very helpful! thanks for sharing useful information. this post is very interesting! thanks for very helpful tutorials.